Rice graduated from Queen's University, Belfast, in July 1956, and joined consulting engineer Ove Arup & Partners as a new graduate, in their central London office. It was to be a life-long association. But before his career could begin in earnest, there was further study to be done. He enrolled at Imperial College, London, for the academic year 1957-8, gaining a masters degree in structural engineering. Ove Arup & Partners had been set up in 1949 by engineer Ove Arup (1895-1988) with Ronald Jenkins (1907-1975), Geoffrey Wood (1911-2007) and Andrew Young. It had already established a solid reputation among architects — though was somewhat outside the mainstream and still relatively small, with a little over 100 staff by the mid '50s. Arups was a lively place, and Rice later said (An Engineer Imagines) that he joined "because I had heard it was a place where an oddball could fit in ... Ove Arup defined an attitude — an integrity towards what one did ...". In an interview with the author in 2012, Jack Zunz (Sir Gerhard Jacob [Jack] Zunz, b.1923), a German-born civil engineer who joined the practice in 1950 and would later become a partner, described Rice as he found him in 1956: "Peter was a very serious, deep thinking man, in the sense that he measured his words very carefully. But he was a bit unkempt — a bit like an overgrown student. He was very honest and direct, and extremely intelligent. Very much above the average." Rice returned from Imperial College in 1958 to work in Arups' Drawing Office No.1 on the project that would dominate his working life for the next decade, taking him all the way to the other side of the world — the Sydney Opera House. The wider story of the construction of this extraordinary building is recounted in our Arup biography. Some time that year, Rice met his future wife, Syliva Watson, a book-keeper from London, the daughter of porter Robert James Watson. She was seeing someone else at the time and they met at a leaving party at Arups for a colleague of Rice's. He thought she was French and they "got on like a house on fire". Trying to get home in the rain, they discovered they both lived in Holland Park. The next day, Sylvia had made dates with two people — Rice turned up first. They shared a love of films, sometimes seeing three a day at weekends, and Rice tried some filming himself. 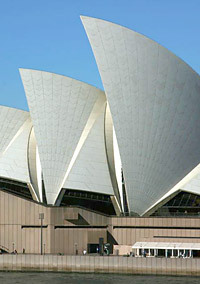 Rice was working in the small Sydney Opera House team led by Arups' senior partner Ronald Jenkins, a brilliant mathematician and leading authority on shell structures. Rice was impressed by his "mathematical elegance". Jenkins was assisted by Povl Ahm (1926-2005), who concentrated on the building's vast podium, and associate partner Hugo Mollman working on its shell roofs. The design for the opera house, by Danish architect Jørn Utzon (1918-2008), had been selected in an international design competition — one of the first held after World War II. Utzon's entry lacked structural detail and its series of soaring curved 'sails', covering the two performance halls, were an exceptional engineering challenge. Arup himself had contacted Utzon and begun a long personal involvement, working closely with the architect to achieve his dream. Ove Arup & Partners' appointment as consulting engineer had been confirmed in February 1957. Initially, the engineers had tried to document the roofs the way the architect had drawn them. The roofs, however, were not based on regular geometry. For more than three years, the team would look for a solution based on using thin parabolic concrete shells. Rice began to hone and demonstrate his own command of mathematics and geometry in the analysis of the forms. From 1958 onwards, physical tests were carried out at Southampton University by a team headed by Jenkins' friend Professor Peter Morice. A wooden model was used for wind tunnel tests and Perspex shell models for load testing. Sylvia recalls Rice's excitement about working on the project and the long hours he spent on it. In an interview in 2012, she described meeting him at the National Film Theatre after he had been in Southampton. He turned up with the latest Perspex model, which he stowed under the stage during the film. At this time, computing was in its infancy and very few people had access to computers. 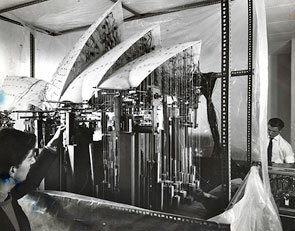 Southampton had an early Ferranti Pegasus valve computer (used two years earlier by Tony Gee for G.Maunsell & Partners' work on Gladesville Bridge), and Rice worked for about a year on calculations with researcher and timber shell roof expert Dr Lionel Geoffrey Booth. Some tweaking of the roof profiles was needed for the maths to converge. Further analysis was carried out at University College London (UCL). Rice thought it marvelous that he could get near-instant results, despite the fact that he could only get time on UCL's computer between 11.30pm and about 3am. He was working from the Arups' office at 13 Fitzroy Street, Fitzrovia. Meanwhile, after two years, Rice and Sylvia decided to marry. Rice's mother Maureen was upset as Sylvia wasn't a Catholic, and she sent Rice's father to London to dissuade them. The wedding took place on 7th December 1960 at St Mary of the Angels Catholic Church, Notting Hill, in the absence of Maureen and Jim, and of Sylvia's parents too — neither couple, nor sister Kitty, was invited. Some time later, Kitty asked Rice why not — Maureen adored Rice and would definitely have gone according to Kitty, who also described her father as the "least narrow minded" person you could meet. Rice said they decided on a small wedding because Sylvia didn't want her parents there. Rice's brother Maurice was best man and also gave Sylvia away. They could only afford a half-day honeymoon in Brighton. Eventually, the parabolic shell solution for the opera house had to be abandoned. It was proving near impossible to achieve, and Utzon changed the geometry to a more-predictable form based on segments of a sphere, all with the same 75m radius. Jenkins, exhausted by the years of struggle, left the team in 1961 and Jack Zunz took over. Zunz had recently returned to London from South Africa. He had recommended that Arups close the office there because of the political situation. Another Arup engineer, Michael Lewis, also came back. The solution now proposed for the 'sails' was a ribbed concrete structure. This enabled the consideration of prefabrication and the analysis of the ribs as indepenedent structures. Rice was now working with a larger team, leading the computer analysis work. He was one of the few people with an understanding of the geometry and able to codify it. The rib form would be re-analysed at a later date by Alan Baker, using more-advanced computing, to prove the overall behaviour of the structure once the ribs were tied to one another. By 1961, the podium substructure was already under construction in Sydney. In the second half of the year, Rice and Sylvia went on their "proper" honeymoon — to Lyme Regis on the south coast, where despite the season, it was cold and windy. Sylvia was already pregnant with their first child. Julia G Rice was born 15th February 1962 and her birth registered in Kensington, London. 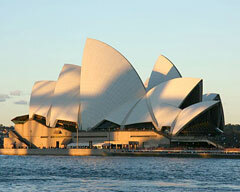 Early in 1962, Utzon set up an office in Sydney, and Arups decided they would do so too. Michael Lewis was appointed to head the team in Australia, concentrating on the design side. 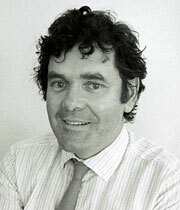 Ian MacKenzie was the on-site engineer, later to be assisted by Rice, Bob Kelman and John Nutt. Rice had requested to go to Sydney as part of his employment agreement with Arups. His second child, Helen Louise (Heidi) Rice, was born 19th April 1962 in London, and in 1963, the whole family moved to Australia. A colleague at the time has described him as more mathematician than structural engineer, not particularly good at drawing but very charming. However, his interest in design was already clear. Going to site for the construction of the shells let him see all sides of the project come together, and brought access to Utzon and the chance to observe the architect at work. Soon after Rice arrived, MacKenzie fell ill and Rice found himself in charge of the roof structure. He was only 28 years old, and he acted as resident engineer for the three years it took to get the roofs constructed. It was hectic time, working closely with the Australian contractor Hornibrook, solving problems as they arose — and the problems kept coming. The family moved to the northern Sydney suburb of Manly, best known for its ocean and harbour-side beaches. And this was were Rice's son Kieran was born, on 27th June 1965. Rice loved swimming in the ocean and he played football on the beach, though there was little spare time as work was intense and stressful. This being Sydney, commuting involved a harbour ferry trip — and he always seemed to be running late. Sylvia remembers him sopping wet from having missed an attempt to leap onto the ferry one day, losing the book he was reading in the process. The roofs of the opera house are composed of a series of precast concrete ribs, each made up of a number of huge segments — 2,194 segments in total. These were supported on temporary steel erection arches until each rib was complete. However, as each segment was added, the structure tended to lose alignment, and this had to be compensated for as each new element was added. Working with John Nutt and surveyor Michael Elphick, Rice worked out how this could be done. They devised a system of accurately surveying pins inserted into both the preceding segment and precise locations on the rib's erection arch. The measurements then had to go through a series of calculations to precisely judge the positioning of the next segment. However, by hand, the calculations were exceptionally laborious, taking days to complete. They worked out that on this basis it would take the rest of their working lives to build the roofs. Recognising that computing power was the answer, they pursuaded manufacturing company Australian General Electric to let them use their computer in York Street. Working with civil engineer Tony Cramm, Rice wrote from scratch a 3D program for the geometry of the whole structure, which enabled a comparison of the surveyed positions with the theoretical positions. Using the computer overnight, they were able to deliver the results each morning for the preparation of the packing shims used to make the necessary adjustments for the next segments, so maintaining the rib profiles. This was a unique use of computers in construction technology at the time — possibly the first use. It was certainly groundbreaking. Arups used the same rigorous surveying and computer techniques for the erection of the huge precast concrete tile-lids and tile cladding. The opera house project was a terrific strain on everyone involved. The challenges and constant difficulties kept Rice working long hours and most weekends. He took up jogging for relaxation and found it helped him think. According to Sylvia, he used to work things out when he was running, come back, get excited and phone people. However, when he was really stressed, his back would seize up. On 5th April 1966, the top ridge segment of the highest shell was lowered into place, and a topping-out ceremony took place involving the raising of a Hornibrook's flag and an Australian flag on a scaffold some 60m in the air. 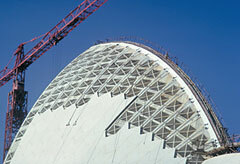 Nine months later, on 17th January 1967, the last shell segment was installed. The Rice family prepared to leave Australia but an attachment to the country remains. In 2012, Sylvia said that she still goes back every year. Rice now spent 18 months in America — six months in New York City and a year at Cornell University in New York state, where he had been offered a post as a visiting scholar, supported by Arups. The family went with him and as he only had to deliver four lectures a term at Cornell, they also went touring across the country. The American sojourn allowed him to rethink his approach to engineering, ready for his return to London and new work at Ove Arup & Partners. 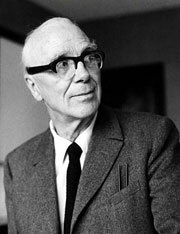 Ove Arup (1895-1988), principal of Ove Arup & Partners. Rice said of Arup that he " ... defined an attitude — an integrity towards what one did ...". for the roof-building phase of the construction of Sydney Opera House. His mathematically and computor programming abilities made precise placement of the concrete rib segments, tile-lids and tile cladding possible. The roof is clad in ceramic tiles that were manufactured in Sweden. Between concrete and tiles is a layer of polystyrene insulation. 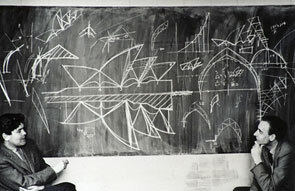 Sydney Opera House — Peter Rice (left) and Geoffrey Booth ponder the behaviour of the proposed roof forms. The photo was taken around 1958, soon after Rice finished his studies at Imperial College. 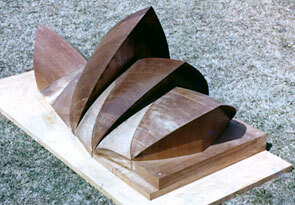 Wooden model of the Sydney Opera House roof, used for wind tunnel testing (c.1958). Physical testing was carried out at Southampton University by a team headed by Professor Peter Morice. 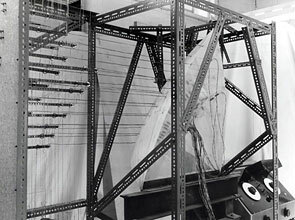 The two images above show Sydney Opera House structural roof model B under vertical load testing at Southampton University (c.1958). 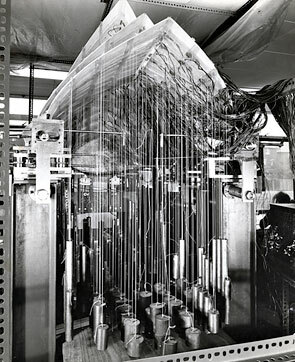 Model C being subjected to loads representing wind forces (c.1958).